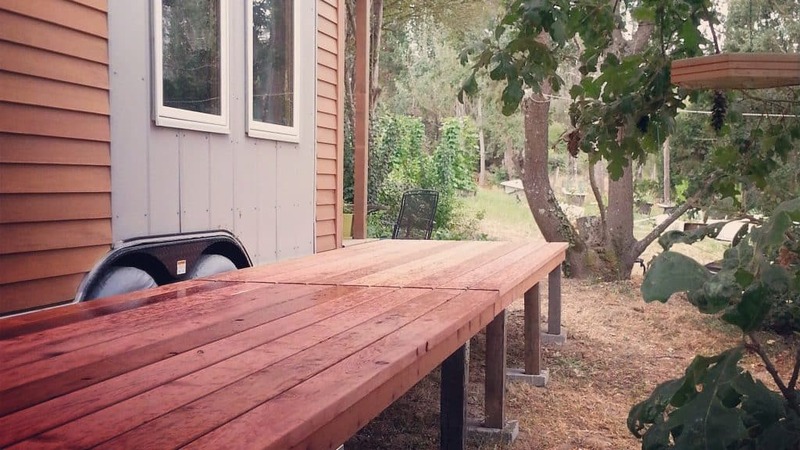 After just completing my tiny home build, I felt I’d be happy never building anything again! I’d had enough construction for quite a while. Recently, 7 months later, that began to change. 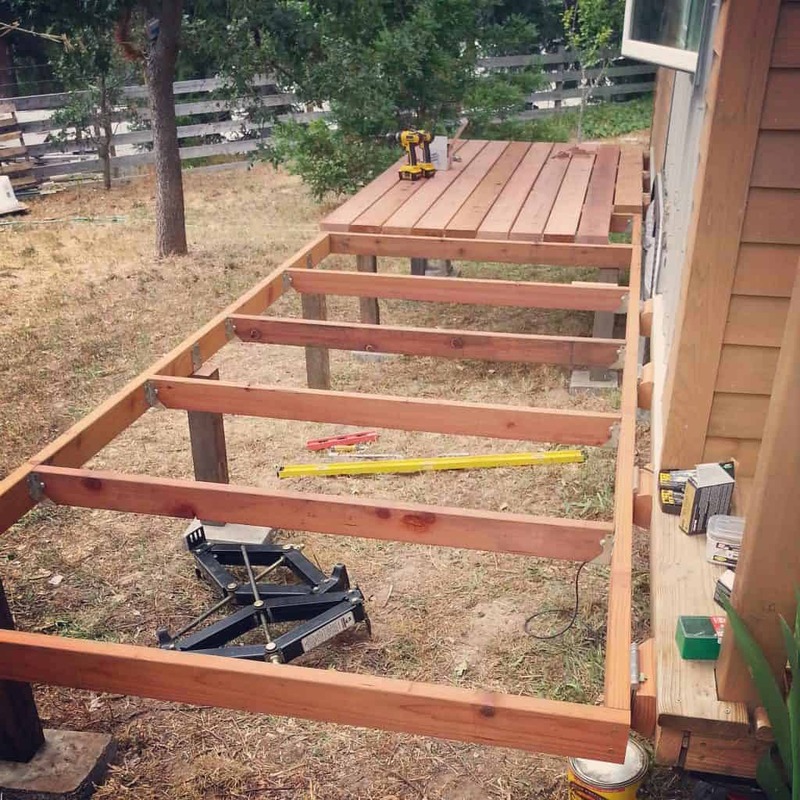 I got the itch to build something new — a perfect opportunity to add the deck that was part of my original plans. 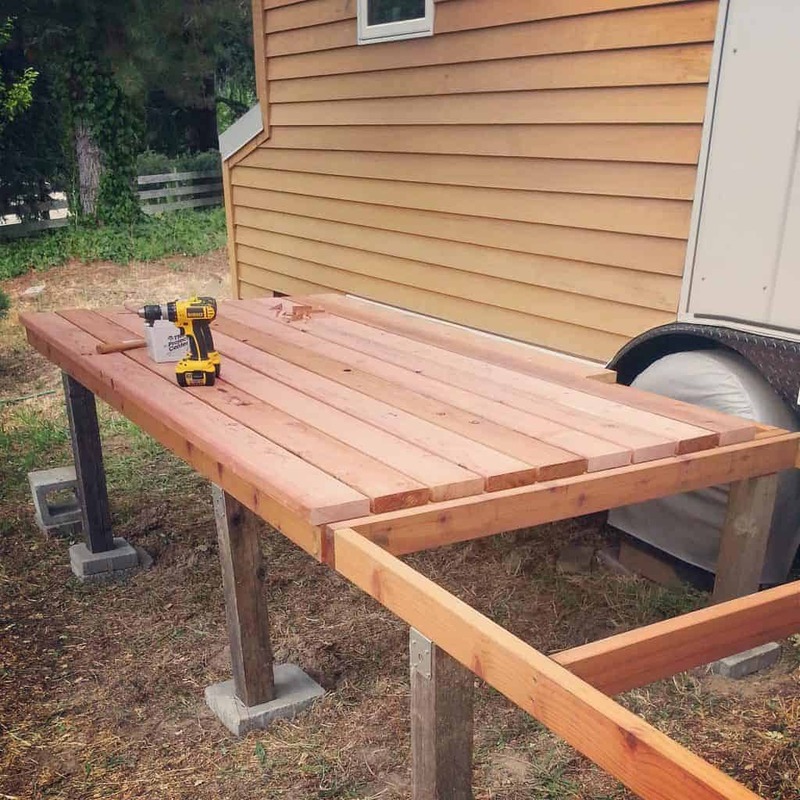 I had decided to wait and add the deck after the long-distance towing was far behind us, and once I was sure I’d be settled in one spot for a while. With an opportunity to borrow a neighbor’s truck, now was the time! 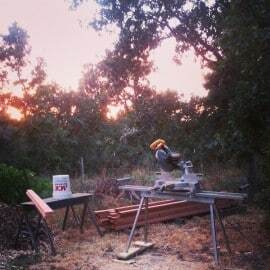 Miter saw set up and ready to go! 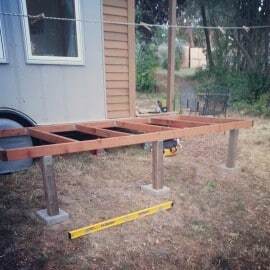 I decided to use redwood for the deck framing and deck surface. 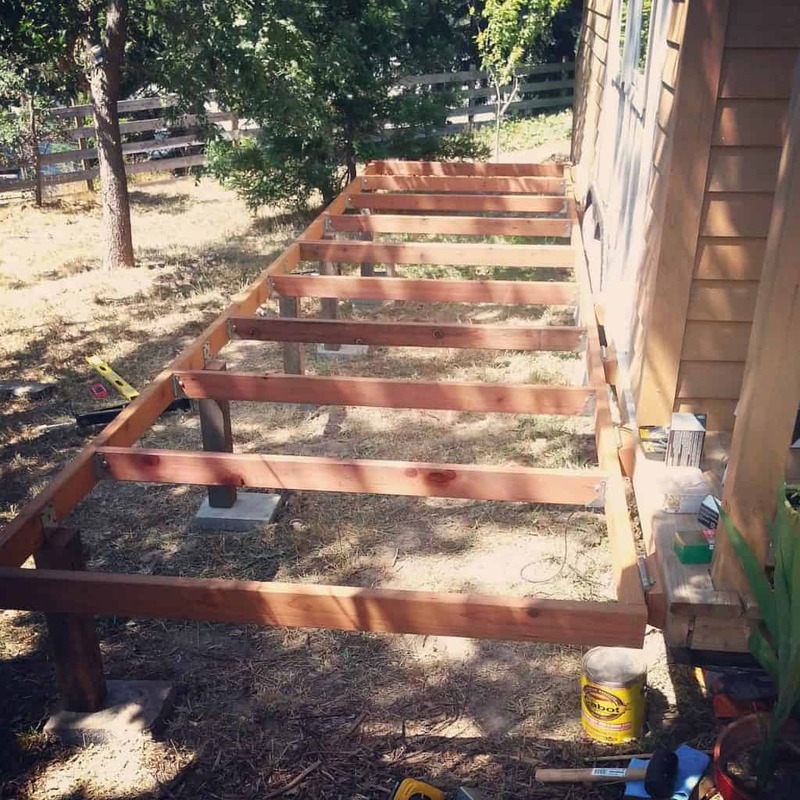 The deck frame doesn’t make ground contact, so treated lumber was not really necessary, and I wanted to use more natural (chemical free) materials where possible. 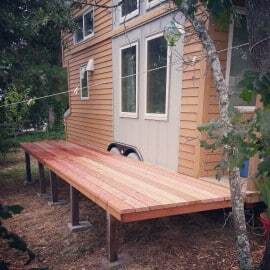 Redwood heartwood also has some very desirable characteristics, similar to cedar. It’s naturally decay and pest resistant, shrinks and warps less than standard pine or fir, and is also lighter in weight. Most California redwood is also sustainably logged, making its use much better for the environment. Though more expensive, these qualities make it really beautiful and a lasting investment for your home. 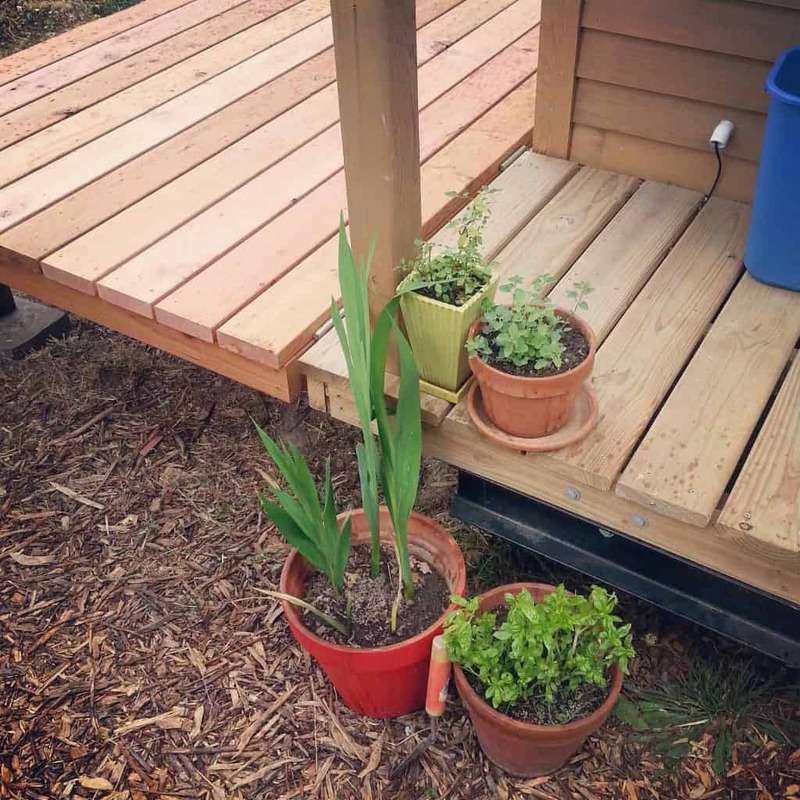 More on redwood sustainability and benefits. 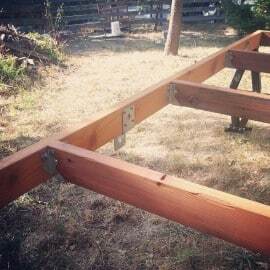 As I began creating the simple framing of the deck, I leveled it carefully with a pair of scissor jacks. Each step along the way, the framing was kept level (and square) to prevent problems later on. This deck was build with some unique considerations and special features. First, it is hinged to fold up against the house when the house is being towed. 7 heavy-duty door hinges secure the deck framing to a ledger board previously added to the house for this specific purpose. 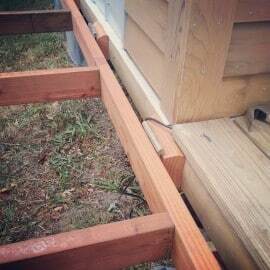 I used small spacer blocks to extend the deck just a bit farther from the house, so it would not run into the trailer fender box when folded up. Later I will add some sort of locking system to hold it firmly in its upright position during travel. The deck also had to be broken up into two sections, so each was not too large and heavy to be lifted into its upright position. Another consideration was to make sure the deck was strong enough to support weight even over the trailer fender box, where it could not be attached to the house for support. An extra, temporary “leg” was added here, so there is no flex/bounce in that area. 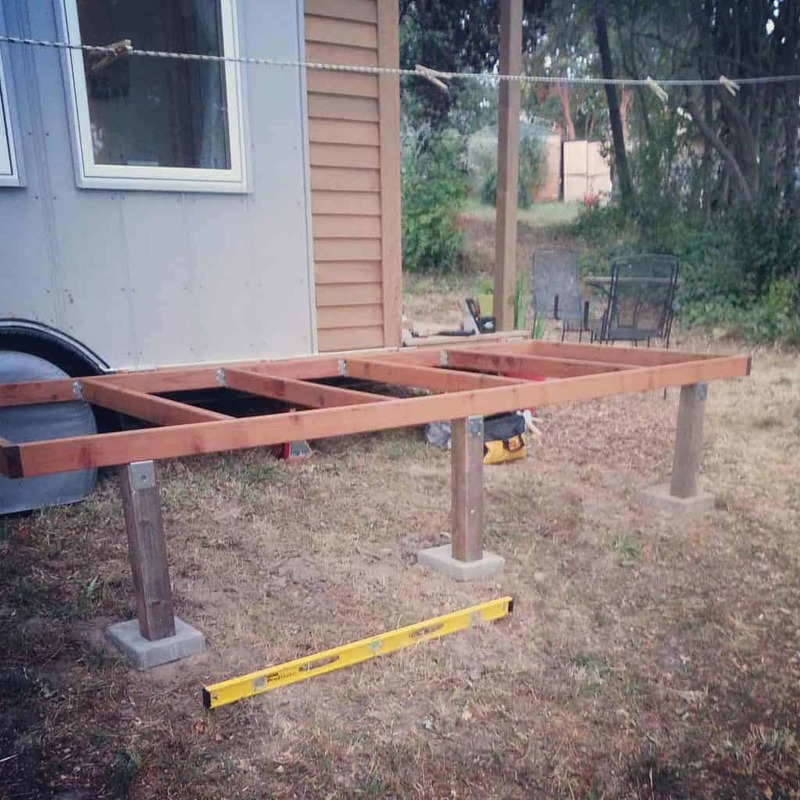 Though technically the house now exceeds the 8.5′ max width (even with the deck folded up), I still wanted to create a deck frame as narrow as possible to keep the total width to a minimum. So I chose to frame this with 2x4s and to hang joists from this simple rectangular 2×4 frame, keeping all the framing within 3.5 inch height. 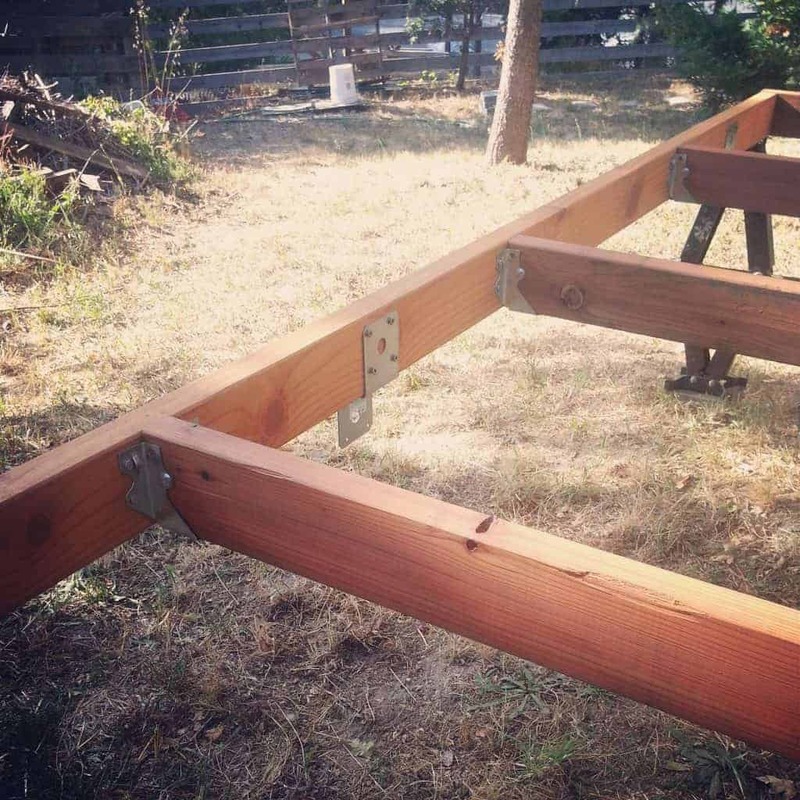 I used screws and joist hanger hardware to secure the joists. 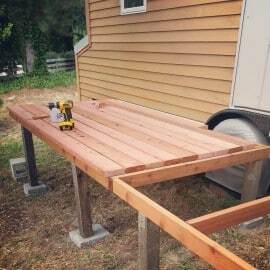 I also added hardware (which can be easily removed) to attached reclaimed 4×4 posts as the “legs” of the deck. These will be discarded whenever we decide to relocate. 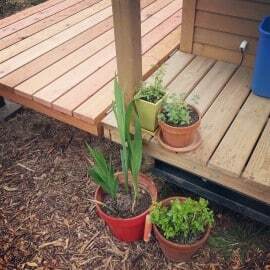 More room for plants and herbs too! I can already tell that having this additional outdoor living space will increase our quality of life. It create a separate “room” of sorts, giving us more freedom and opportunity to find privacy and quiet when needed. It will also be great if we ever entertain larger parties, or just want a place to sit and enjoy the sunset! I strongly suggest all tiny house owners to consider their how to maximize their surroundings to create a great sense of usable space in and out of the house itself. 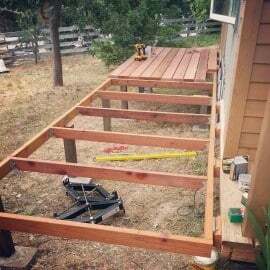 Want to build a deck like this? Make sure you have the right tools! 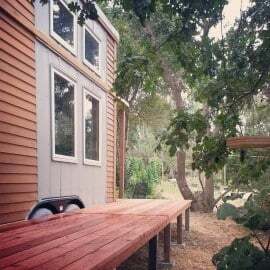 In my experience, building a tiny house requires a lot of things: it requires creativity and determination; It takes willingness and motivation to learn and try, to fail, to problem solve, and continue; It takes patience. Those are the intangibles. What else does it take? The proper tools are essential! It’s hard to know how important some of these things are until you realize the hard way (by wasting a lot of time!) how much energy and frustration a good tool can save you. 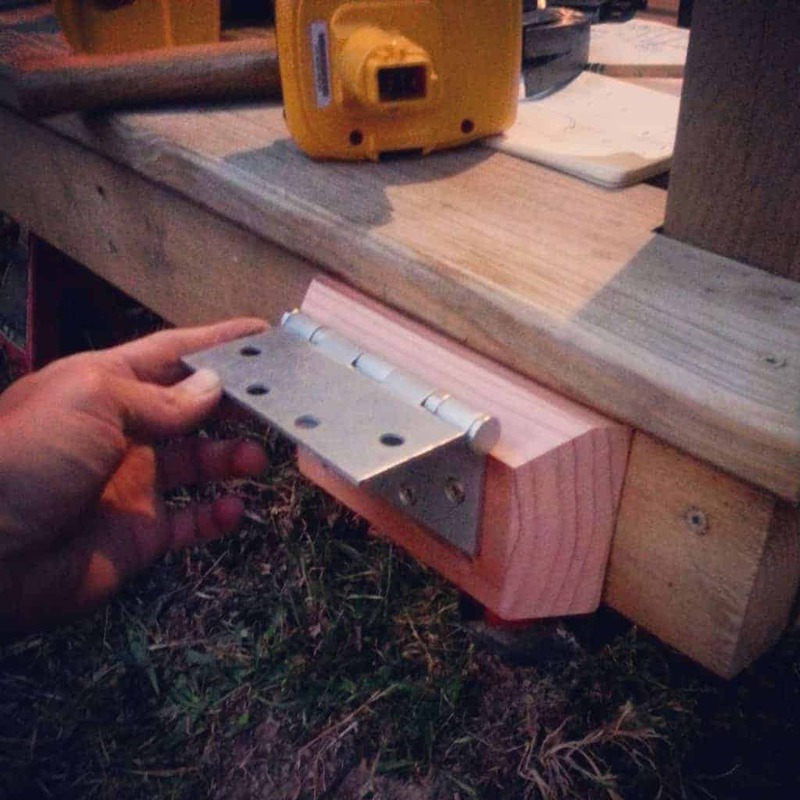 So, without further ado, here are my top 10 must have tiny house tools. Hey great work. Am in the planning stages of designing a fold out deck just like the one you have created. Thanks for the documentation! Fantastic! Thanks for the great article! 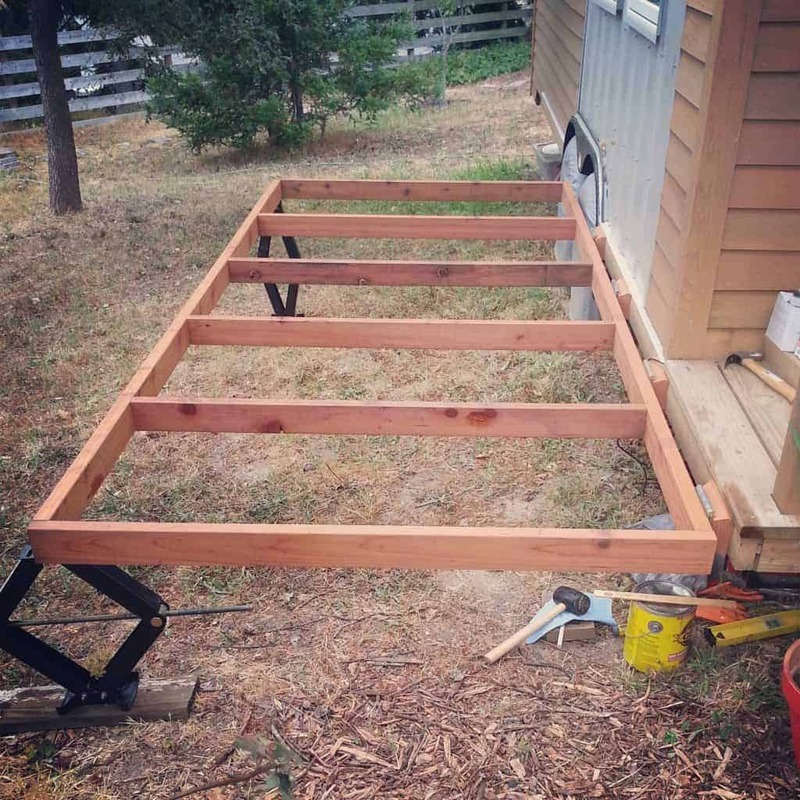 I was seriously considering adding a folding deck onto my house plans. I’ll definitely be referring to this article as I go.